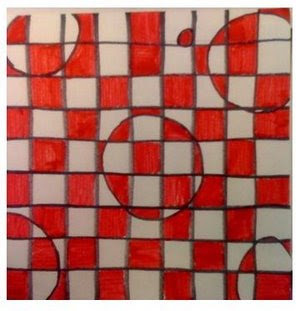 Optical Illusion is always a hit, and I'm always looking for a way to teach it in some way that's not too difficult. I find, that, no matter WHAT...it's always got some level of difficulty. You can even see in this student example that there are some errors, but you can get the general idea. 1. First, start with a 9x9 piece of paper. 2. Create a simple design with shapes. I prefer circles. I like when they go off the paper, too. 3.Use a ruler and make inch marks going down two sides of the paper (must be on the corner, or "L" of paper). 4.Connect the lines to make a grid. 6.Pick ONE color of marker. I think this is a great idea to catch a elemaentary schoolers eye because not just 1,2&3 graders would like it, older kids would like it and learn a new thing in art to increase mind. Good thinking Kate and I will hopefully do this project with a child soon! Tried this yesterday. Love it. We plan to do some of these in homeschool art this year. Thank you! I really appreciate sharing this great post. Keep up your work. The single biggest problem in communication is the illusion that it has taken place. See the link below for more info. One art show down, one to go.